This 4-star hotel in Hamburg offers beautiful views of the River Elbe, a wellness area, and easy access to the A1 motorway. The modern Hafencity district is a 5-minute drive away. 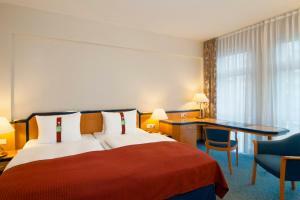 The Holiday Inn Hamburg has bright rooms with a variety of international satellite TV channels and free soft drinks from the minibar. Free Wi-Fi is available in all areas. 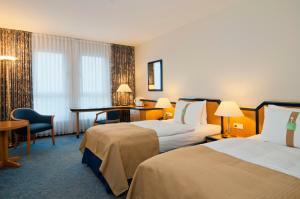 The hotel has 2 towers, one for the standard rooms and one for the higher-category rooms. Spa facilities at the Holiday Inn Hamburg include a pool with panoramic views, a fitness studio, and a massage/beauty area. Paid child care services are also available upon request. Wi-Fi via hotspot is available in all areas of the Holiday Inn. The internet terminal in the lobby is free. International food is available at the Holiday Inn Hamburg's Elbgarten restaurant. Children up to the age of 13 enjoy one free children's meal if at least one parent dines à la carte. Guests can also relax in the Windfang pub.